Bringing Providence’s zoning code into the 21st Century is a goal of Mayor Taveras’ economic development action plan, Putting Providence Back to Work. The updated Zoning Ordinance is the result of more than a year of collaboration between City departments, residents, businesses and institutions to develop user-friendly zoning regulations that closely align with the City’s Comprehensive Plan. Come be a part of a comprehensive overhaul of the Zoning Ordinance, and help us reshape the future of development in Providence. 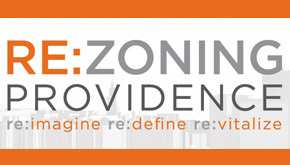 For more information, please visit the project website at rezoningprovidence.com or call (401) 680-8400.